We have published a post about Extrasphere last year when they released their 2.0. During that time, their product has had the ability to migrate VM between ESXi hosts with (almost) no downtime, as well as provide full migration (including VMDKs) between hosts. (including ESXi Free version). Today we'll have a look at their Extrasphere 3.0 which brings very interesting Hot Mirroring technology using VMware vSCSI filters. The hot mirroring allows keeping in sync two VMs, where source VM and destination VMs are completely in sync with Zero Recovery Point Objectives (RPO). I'll talk about details later, but in somehow this is kind of comparable to VMware Fault Tolerance (FT) where you have the first VM and the second VM in sync, but VMware technology is different. The HotMirror feature is a continuous process that transfers VM changes on the fly – it's not a kind of snapshot-based replication. Standalone “ESXi Hypervisor” (free) hosts are also supported. Extrasphere team is a small group of independent developers and consultants which focuses on applications for VMware vSphere environments. It's pretty exciting to see, how an even small company is able to innovate using latest VMware technologies and make some cool inventions and software creations. An Appliance VM – also called Extrasphere VA, which holds the different vSphere Installation Bundles (VIBs) needed to be pushed to each of the ESXi hosts used. It is a Linux VM which is preconfigured and distributed via OVA files. The product evolves, and on the roadmap is a version where the virtual appliance VM will have a web-based front end accessible from any platform, any device, and where you'll be able to install and manage the system, initiate the VM's operations, do a maintenance etc. But for now, it is client and server model, with a UI which is kind of rudimentary, as you'll see. A client machine or VM (Windows or MAC). Operations on non-shared datastore require Proxy VMFS to be enabled in Extrasphere VA on the target host. 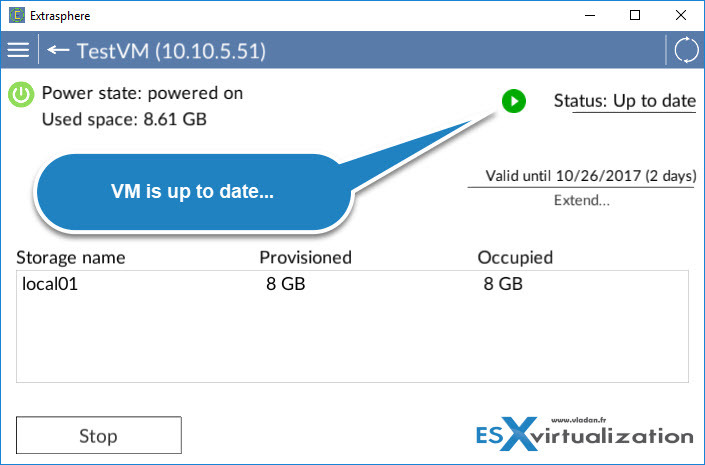 VM Migration – You can migrate a running VM from one ESXi to another, via shared datastore. If you don't have a shared datastore or want to migrate to local datastore at the destination, you can use a Proxy VMFS technology from Extrasphere (not active by default). 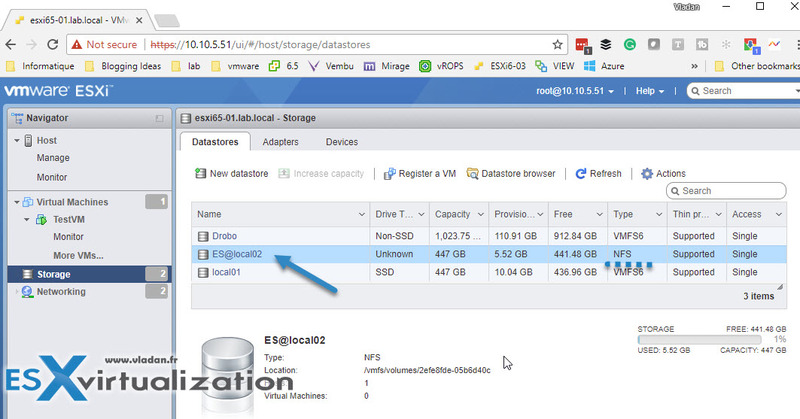 You can also migrate a VM within the same ESXi but be specifying different datastore for the destination. VMware calls this storage vMotion, but you need to have it licensed from VMware. Extrasphere app can do almost as well in both cases, but there is a short downtime during which Extrasphere moves dump of VM memory and other small files like vmx. Then move VM when downtime is controlled and possible. In this case, the second movement will not move disks again but just registers and starts the VM at the destination. The VM Migration feature is free. Proxy VMFS, Hot Clone, and Hot Mirror are bundled as 30 days trials and licensed on a per-host basis. Hot Clone – The process creates a clone from a running VM. After cloning, the VM is powered on. If you're not using VMware vCenter server in your environment, you can't do a clone (for individual ESXi host you don't have that option). Hot Clone uses the same technology and process as a Hot Mirror, but with a difference that once the clone is done, the newly created VM (the clone) is activated and if after you have some modifications, they're not reflected at the destination (clone). The difference from HotMirror is that upon reaching the “Live sync” phase the failover occurs automatically, i.e. the mirroring is stopped and the mirror machine is powered on. 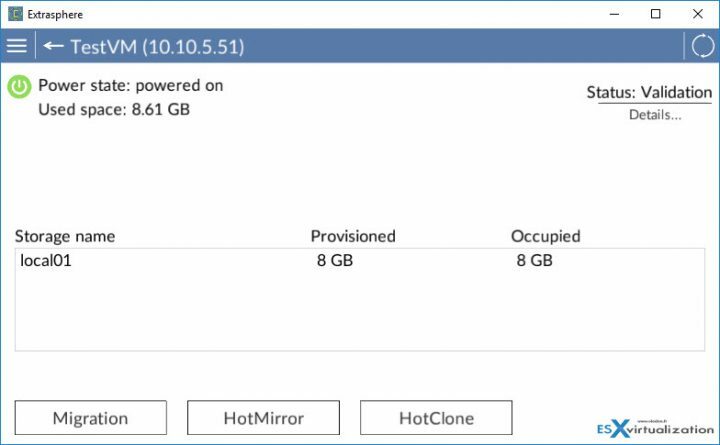 Hot Mirror – The Hot mirror creates a mirror VM first, but then the source and mirror VMs are both powered on. Upon reaching the “Live sync” phase, the mirror VM gets only the I/O which modifies the data on the source VM. As a result, the mirror VM does not consume any (or very little) RAM resources, and some CPU. The Mirroring technology uses VMware vSCSI filters technology. Hot Mirror allows you not only to failover to mirror VM in case of disaster but also to run a linked clone VM from the mirror (which is called test VM ) in several tens of seconds. The test VM can run on any of the ESXi hosts registered in Extrasphere which have access to the datastore where the mirror is located. The number of test VM instances is limited only by CPU/RAM resources available on the ESXi hosts. This test VM can be useful in a situation where a VM experiences high CPU usage (end of the month reporting, for example) or when you need a safe branch of your source VM (to check system update, for example). By creating a test VM you can possibly let your users use the source VM while the test can process some other tasks on another ESXi host. Zero RPO – if your target mirror datastore is fast enough (or has the same or similar performance/latency) to keep the pace with the source VM's I/O writes, you will put the mirror in a state where there is no duplicate of the source data modification requests. The I/O data are written directly at the destination VM. 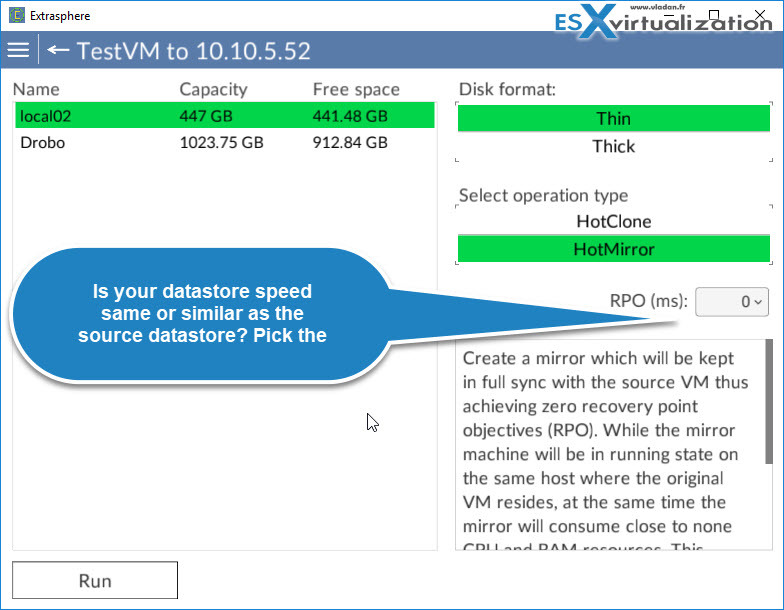 Almost-Zero RPO – the modification I/O data is first copied to a temporary buffer, then applied to the mirror VM with a rate that is supported by the target datastore. Non-Zero RPO mode is syncing the source and mirror VMs, but the mirror VM is a little bit “behind” depending on the value specified within the settings. If your target datastore isn't fast enough you may need to activate this mode otherwise the original VM will be “slowed down” to adapt to this situation. It is highly recommended to change the root user default password after the first deployment because Extrasphere VA with Proxy VMFS enabled can access VMFS directly. From the same location, you can download also the client app for your platform (Windows, MacOS). The Extrasphere licensing is simple. After installing and activating a trial license, the product operates in 30 days trial for Hot Clone and Hot Mirror, where the VM Migration stays free. Hot Clone and Hot Mirror are licensed per ESXi host. 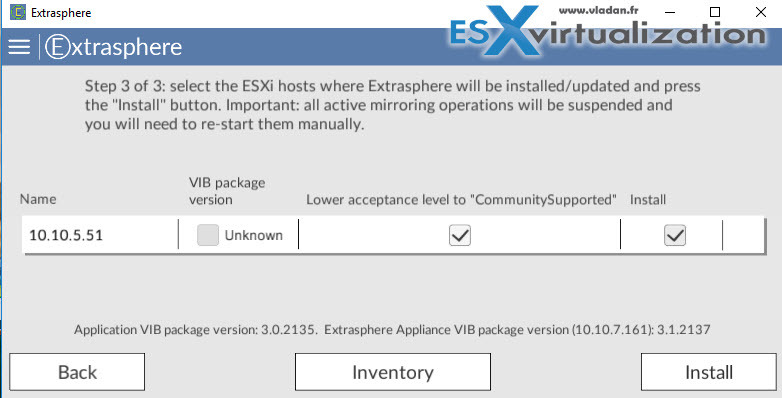 The first step – deploy the Extrasphere Virtual Appliance (VA) to one of your ESXi hosts. Simple, via vSphere client. The appliance will pick up an IP address from your DHCP server. We keep DHCP for our test, but you have the possibility to assign a static IP address. The second step – download and install the Extrasphere App. Chose the one according to the OS you're connecting from. (Windows, MAC). 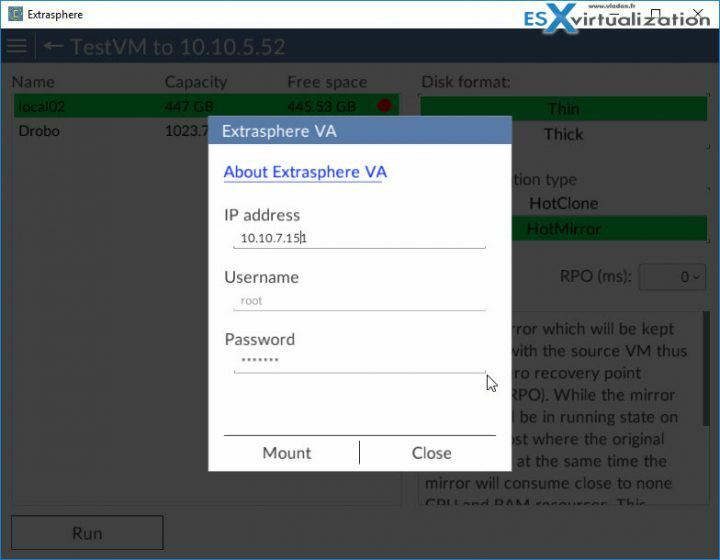 After the launch of the Extrasphere App, connect to the Extrasphere VA and then connect to your vCenter. If you don't have vCenter server, you can connect to your ESXi hosts, one by one. 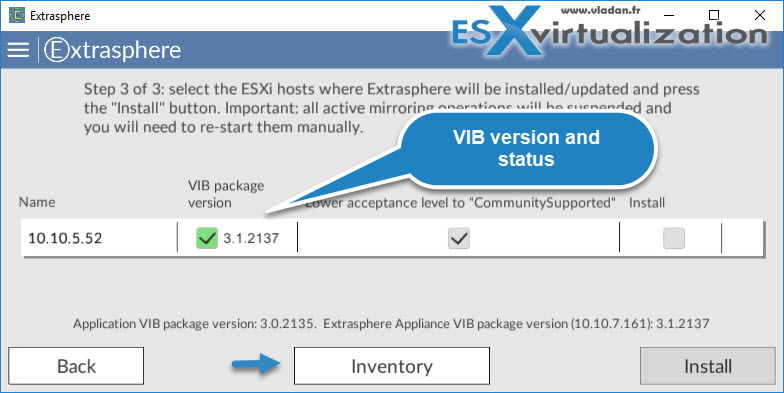 Third Step – is the step where we'll lower the acceptance level to “CommunitySupported” installation and install the VMware Installation Bundle (VIB). So let's Check our hosts > Check Lower the acceptance level to “CommunitySupported” > Click Install Button. The package installs on the host. If you have another host which you would like to manage via the Extrasphere App, you'll need to repeat the process. We can be in a situation where we have an environment managed via VMware vCenter server. You'll see something like the environment below. I took a screenshot while I'm managing the environment via vCenter server so I only need to connect once, to see all my ESXi hosts. As you can see I can easily select/unselect hosts and let the VIB package be installed on my hosts. For environments which do not have vCenter server for central management, you must repeat the operation for each ESXi host. After the installation, you'll see a green point with a checkbox showing you that the host is installed with the VIB and you'll see the version of the package as well. After the installation completes click the Inventory button to get an overview how many hosts you are managing via the app. The system shows different ESXi hosts available. The UI has a menu on the left top side, and also a button called All VMs at the bottom. When clicking the button the system retrieves the current VMs list from the environment. The Top left menu has the Setup Wizard, Console, Settings (allowing you to use a proxy within your environment or uncheck a usage stats logging). Click on the All VMs button to obtain a list of VMs which is present within your environment. Hmm, my test environment has a single test VM only as I “pushed” the installation VIB to two test ESXi hosts. But you should see all VMs running on particular ESXi installed with Extrasphere VIB package. Then when we click on a TestVM, we'll get the different options what we can do. And as you can see, we can Migrate, HotMirror or HotClone. Let's try the HotMirror operation. Next, we need to select a destination host. Let's pick another host, and on the next screen, we need to select also a destination datastore. We could stay on our shared datastore, but to demonstrate a possibility to mount a local datastore, we do select another datastore – a local datastore of the destination ESXi. The red point next to each datastore means that this datastore needs to be mounted first. And that's where a term called VMFS Proxy cames into a play. And to do that, we need to connect to the Extrasphere VA again. (See below). Hit the Mount button. 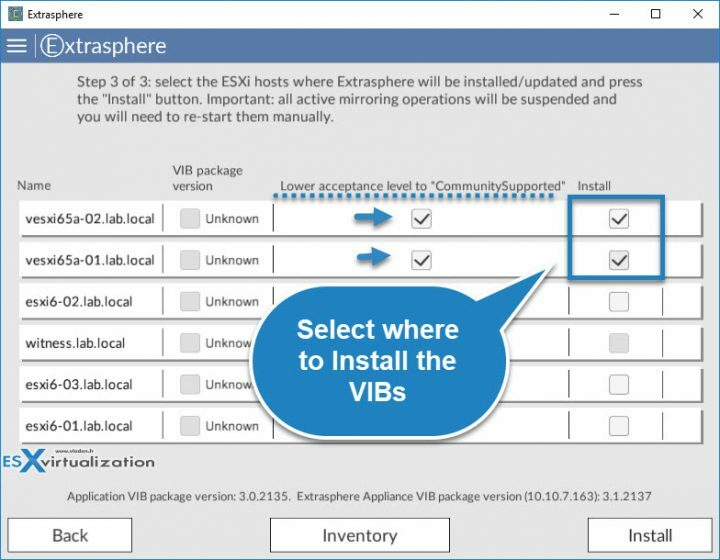 Extrasphere VMFS Proxy – is enabled on the specified Extrasphere VA there is NFS v3.0 datastore mounted to the source ESXi host. Access to the datastore files via NFS is restricted by the source ESXi host address automatically by Extrasphere 3.0 when it configures the NFS share. If you reboot the Extrasphere VA the NFS share hosted on it will restore at the same mount point. Let's get back to the Extrasphere App, which no longer shows the red icon on the local datastore. It means that we can use this datastore for our Hot Clone or Hot Mirror operations and for VM migration. Before we hit the Run button to do that, let's talk a little bit about the requirements. The source VM cannot have snapshots or virtual disks configured as independent disks (RDM disks aren't supported either). Virtual Hardware of the same version must be supported on a destination host. You need a license from Extrasphere. Now we picked the destination host, storage and also RPO for our Hot-Clone VM. 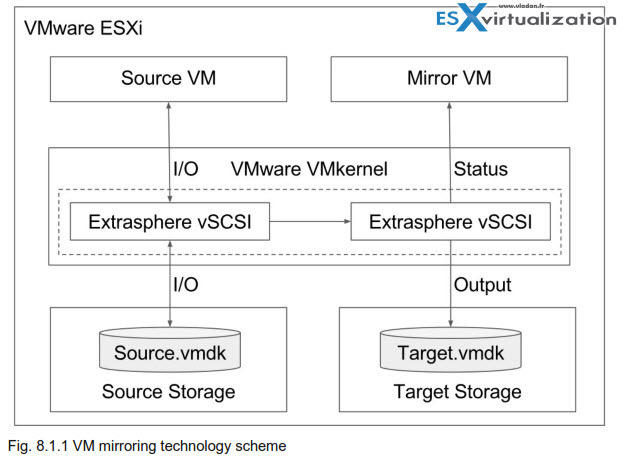 The system creates a mirror VM which resides on the source host along with the original VM. Here is the view via the Extrasphere app. We can see the status saying “up to date”. And view on the host shows those two VMs. However, one should imagine that the mirror VM has its data (VMDKs, VMX etc) stored on the local datastore of our second ESXi host. And this datastore is mounted via NFS to the first ESXi host. How to do a failover? What would be a DR for if there would be no hardware or software failures? Extrasphere covers both. Extrasphere provides manual failover process. You can failover to another host if the source host is down. For this case, there is a special “stub” VM created on the second ESXi host. The stub VM does not have any data but allows performing failover. If we have a look at the second host we can see this stub VM. A mirror VM will be registered on the selected target ESXi host and will be powered on in normal mode. Extrasphere will Disable vSCSI filter > delete the mirroring status virtual disk > revert to original VM loading type. It is definitely a promising product, but it needs a clean UI which would make the work with it really nice and pleasant. The current UI works but is kind of “old”. The Extrasphere VA is mostly used for the initial configuration. If you don't need to do VMFS mount after pushing the VIBs to your ESXi hosts, you can safely shut down the virtual appliance as it is used only for those operations. (Also for updates). We have detailed pretty much the installation and setup. The Free VM Migration feature allows migrating running VMs from one host to another with small downtime. The fact that the solution works even for environments without shared storage can be interesting for scenarios such as migrations within ESXi hosts populated only with local storage (DAS). Hot Mirror and Hot Clone are powerful features which allow setting up DR scenarios and execute protection strategies without much effort. The only paid feature are Proxy VMFS, Hot-Mirror and Hot Clone. The free VM Migration gives you a good overview of the possibilities. Whether you're looking for a product which can do a DR for your VMs, it may be a solution for you. A future release will also have an application consistency so even DB servers can be part of the plan. Also, the Extrasphere virtual appliance will have a web-based UI in a future release. If you running a particular environment with ESXi free hosts (seen in many cases) and (or) hosts managed via vCenter server but without much DR, you certainly look into some kind of DR protection. An RPO in seconds can be quite appealing IMHO. Please note that this review was sponsored by Extrasphere. login fails trying to connect dircet to an ESX 6.5i Host. ssh and webinterface are working without any problems. Extrasphere defects to our support team at [email protected]. Uh… so this product no longer exists? the source forge page and website have both vanished. entirely. Did the developers go bust? or get busted for cyber crime? the thing about the virus in the last version was a little shady. I think that the product hasn’t got much success as the developers would like to have, so I think they just returned to consulting. So yes, the business is closed. And the virus alert, that was an accident.